You’ll definitely fall in love with this cute ‘n charming Alina girls’ apron. It is perfect for your mini-me! It will make crafting time more enjoyable and a tad less messy! Once finished, the apron should measure approximately 20 inches (51 cm) wide and around 19.5 inches (49.5 cm) tall, excluding the straps. 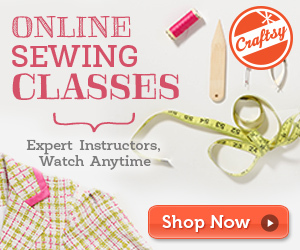 This girls’ apron is an ideal project for intermediate crafters. This pattern is another wonderful design by the talented creators over at I Think Sew. In fact, you can access the FREE downloadable pattern for this cute apron from the Craftsy website. To access the FREE pattern for this awesome piece, please click on this link: Girls’ Apron Pattern.